While the dark, cold, rainy weather may have been a downer for costumed candy-seekers, it's helping up my spooky mood for tonight's post (actually, the weather and this Pumpkinlord demo on Bandcamp are both helping me out here). 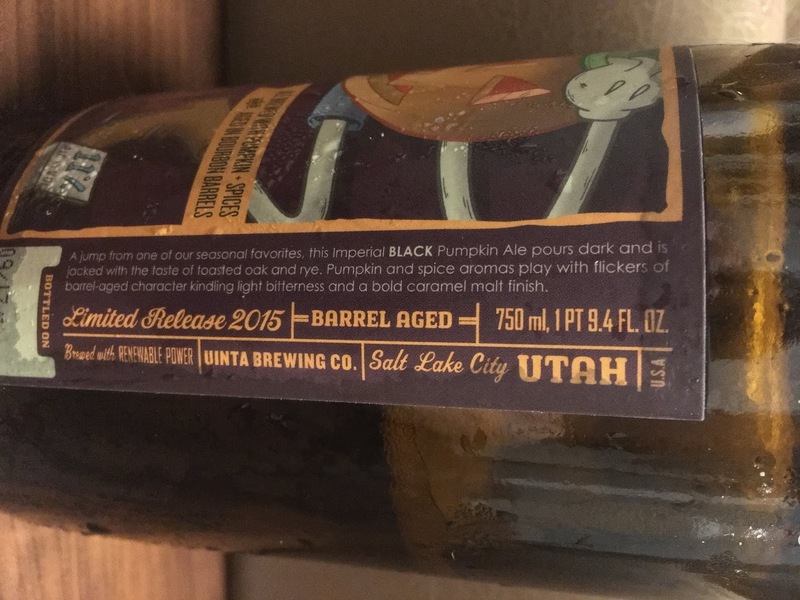 A few weeks ago I drank a barrel-aged imperial pumpkin ale that I absolutely adored. What better way to close out the month than by revisiting the style? This evening's brew comes to us from Uinta Brewing Company. The Utah-based company's been in the beer business since 1993, when they original opened in an old automotive garage. By the following year, they'd made over 2,000 barrels of beer. Since then they've built a new large-scale brewery, become completely wind-powered, introduced a barrel-aging program, installed solar panels, and continued to expand. Their brews can now be found in 35 states. Be sure to check out their "Our Story" page for the full details on their history. I bought this bottle of Jacked B Nimble, which is, of course, the beer I'm drinking tonight, back in July when I was begging for an early fall. When I saw it on the shelf at my local bottle shop, I nabbed it without really looking at the bottle--it said "Imperial Black Pumpkin Ale," and that was all I needed. It was only when I'd decided to save it for this post that I really started investigating it. It was bottled, as seen on my Instagram, in September 2015. Meaning that it's been aging for three years. Please note, in case I need to explicitly state it, that I'm not reviewing this beer as it was freshly bottled. If you pick up one that is, don't expect it to be like what I'm about to describe. Not that you could pick it up freshly bottled. Since the brew's nowhere to be found on Uinta's website, not even in it's Archive, it's probably safe to assume that it's no longer around. Oh, and all the pictures of bottles/labels of it I've seen mirror mine in calling it a "Limited 2015 Release." Luckily, my bottle has all the information I need to start forming an idea of what the ale's like: At 11% ABV, Jacked B Nimble has aromas of pumpkin, spice, and woody warmth from the barrel aging process. It's flavors are of oak, rye, pumpkin, and caramel, all wrapped together with slight bitterness. I get the pumpkin and spice aromas without issue. There's also a sour fruitiness at play here in the bouquet--think along the lines of a Granny Smith apple. By digging a little deeper, I find the oak barrel woodiness from the aging process of the ale. And that's all I can suss out here. It's an intriguing nose, one that just begging to be followed up with a healthy swig. It's also one that isn't for Purrl, apparently. She gave the bottle four whiffs before resuming her guard against the spooky Halloween darkness. Jacked B Nimble's flavor is far from what I was expecting! I went into that first swig hoping for a boozy warmth fueled by pumpkin spice goodness. What I found was a dry sour funk. It's not unpleasant but, unfortunately, it overpowers everything else that's here. And there are other flavors: the pumpkin, the caramel, the spice. the oak--they're all here, but you really need to seek them out to find them. The warm boozy wood barrel bourboniness is here in the finish, so that's a big plus. But that's even overpowered by the funk, meaning that it doesn't taste like an 11 percenter. NOTE WHILE EDITING: After giving my bottle some time to breathe, the wood and bourbon bite come through more. The funkiness is still here, it's just far more subdued. The mouthfeel gives away that 11%, mind you. Each swig is enormous--it's like taking a bite of bread. Nice and chewy. When I was a kid, the neighborhood I lived in was on the edge of a forest. If you walked to the end of my street, the neighborhood ended and the forest began. I loved exploring that forest with my brother and any of the handful of neighborhood kids who'd willingly tag along. When I was somewhere around 9- or 10-years-old, we went further into the woods than we'd ever been. We came upon a clearing that was full of deer skulls and bear traps. Just beyond the clearing was a dilapidated, abandoned two-story white farmhouse. The door was wide and we poked inside. There was graffiti everywhere. We didn't get further than the living room (which the front door led immediately into) but in the corner there we could spy a stairway. On the outside, through a window upstairs, we could see a door spray painted on the wall with "PORTAL TO HELL" scrawled beside it. That terrified us. Before we all ran back home through a maze of trees, we braved checking out the barn. The thing was in terrible shape, leaning over and shuttering in the wind. Inside, lining the dirt floor, were old toys. Baby dolls galore. Some Fisher-Price stuff from, presumably, the '70s or '80s. Needless to say, the whole affair was sufficiently creepy. I know my whole "beer from the bottle" stance, but I had to see for myself how dark this was. While it wasn't exactly black, it was exceedingly dark. Uinta's Jacked B Nimble has aged well, I'd say (granted, I haven't had it unaged). It's funky and boozy and has the nose of a pumpkin ale with the woody warmth of a good bourbon barrel-aged offering. While it's not what I'd initially expected, it's grown on me over the course of this post. I'm giving it a 9.0/10. It's exactly what I'd want on a dark, rainy Halloween night like this.